Will Roper is the founding Director of the Pentagon’s Strategic Capabilities Office (SCO). Established by Secretary Ashton Carter in 2012, the SCO imagines new—often unexpected and game-changing—uses of existing government and commercial systems: extending their shelf-life and restoring surprise to the military’s playbook. SCO also analyzes options for revealing capabilities prior to conflict to increase doubt, impose cost, or maintain deterrence against potential adversaries. Since 2012, SCO has grown from $50M to $900M per year in the President’s budget. Its projects span concepts including hypervelocity guns, multi-purpose missiles, swarming micro-drones, autonomous fast-boats, smartphone-navigating weapons, big-data-enabled sensing, 3D-printed systems, standoff arsenal planes, and more. Whether by repurposing, teaming, or leveraging commercial investments, these projects create unconventional ways of warfighting that are lower in cost and faster in pace than traditional ones. 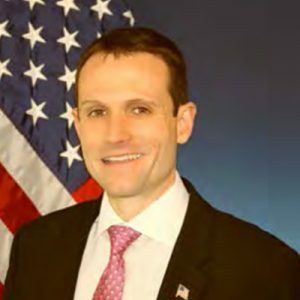 Prior to directing SCO, Dr. Roper served as the Acting Chief Architect at the Missile Defense Agency (MDA), worked at MIT Lincoln Laboratory, and served as a missile defense advisor to the Under Secretary of Defense for Acquisition, Technology, and Logistics (USD/AT&L). His awards include the Department of Defense Medal for Distinguished Public Service, the Secretary’s Award for Excellence, USD/AT&L Award for Innovation, MDA’s Innovation and Technology Awards, and MDA’s Contractor of the Year. Both a Truman and Rhodes Scholar, Dr. Roper graduated with highest honor from Georgia Tech with a bachelor’s and master’s in physics and a doctorate in mathematics from Oxford University, where he specialized in String Theory.